If you read a horror magazine on a Monday, maybe Monday won’t seem so horrible. Unless, of course, your average Monday involves vampires or insect attacks. 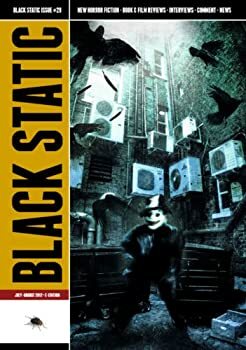 There are five stories in Issue 29 of Black Static, and every reader is likely to find one that at least makes her uncomfortable, if not scare the wits out of her. The first is Nina Allan’s “Sunshine,” a new take on vampires. Beginning with a quotation about medicinal leeches that was itself enough to make me shudder, Allan discusses the hirudo (her name for vampires, based on the Latin taxonomy for the leech, hirudo medicinalis) through the first person account of Daniel Olsen. Olsen describes a species that is born, not made; only one in every thousand victims left living by a hirudo will become a hirudo itself, and the others all ultimately die, even if many years later, from an illness transmitted to them by the feeders. Daniel himself prefers to kill his victims with a spike to the carotid artery, from which he drinks. His life doesn’t seem to be particularly happy, but neither is it unhappy; it just is. The focus of the story is his temporary love for a human woman and his interaction with her strange brother. Oddly, the story shifts toward the end to the tale of a completely human serial murderer, and while it all ties together, the hirudo loses something of his power in the shadow of this human monster. “Horseman” by Renee Carter Hall is a twisted tale of the birth of an unearthly foal. The newborn shows scales as well as fur, cloven hooves, fangs and a taste for meat instead of oats or hay. His owner, mourning the death of his wife, is initially horrified, but soon finds a way to make use of the monstrous creature. It’s a short and atmospheric tale. The story that made my skin crawl the most was “Chodpa” by Baph Tripp. I’m not a fan of insects, and this tale of a man encountering large numbers of large insects while on vacation to an unnamed foreign land still has me jumping at the sight of a spider. The hints that the bugs have some greater meaning sowed randomly through the story remind one that it has been said that cockroaches will inherit the earth, outliving the human race. Were this story true, it would seem that the end is nigh. But it’s fiction. Right? For a first story by this author, it packs a hefty punch. Ray Cluley’s novellete “Shark! Shark!” is a brilliant piece of metafiction about the filming of a movie about sharks. We get the story of the making of the movie at the same time we get the tale told by the film itself, in the sly, cynical voice of a nameless narrator who addresses readers directly. There are plentiful references to “Jaws” and to the Discovery Channel, with judicious sprinklings of information about sharks and especially their teeth. Just when you thought it was safe to go back in the water! “The Counterweight” by Tim Lees is the story of yet another sort of vampire, the sort who grabs onto you in every social situation and won’t let go, dropping in at all hours, borrowing this and that, until before you know it he’s living in your house and your health is shot. Whether Sophie will be able to save herself from Barry is a real question, for in a short span of time she loses her health, her job, her hair and, above all, her peace of mind. I remain awed by the breadth of reviewing in Black Static. Tony Lee’s film reviews have saved me from huge numbers of bad films; he reviews 19 films in this issue, which means he has to be watching a DVD at least every other night, poor fellow. Mike O’Driscoll provides “Silver Bullets,” a column on television, which in this issue covers “True Blood,” “Dexter” and “Braquo,” the last of which is unknown to American viewers so far as I can tell, though O’Driscoll mentions that there is talk of an American remake. Peter Tennant reviews three books by Nicholas Royle, whom he interviews as well. In addition, he reviews two books based on horror movies, five chapbooks, 11 novellas and one magazine. It’s quite a feat of reviewing, with sharp writing and pointed opinions. There are also comments — short essays on the nature of horror fiction — by Stephen Volk and Christopher Fowler. As good as the fiction in Black Static is, the magazine is worth purchasing for its nonfiction alone.